Q. How do I enter chemistry equations in MS Word? If you have the Lucida Sans Unicode font installed (check the font list in Word) you are in luck. When you want to insert a symbol, click on the Insert menu and choose Symbol. In the font box select Lucida Sans Unicode. You will see a very rich selection of specialized characters available for use in Mathematical Operators. Here are a few that might be useful. For MS Word 2007/2010/2013: use the equation feature, designed for math, but works okay for chemistry. Click on the equation button on the far right. Here are also shortcut commands to render most common things. For example, underscore _ creates a subscript and a caret ^ creates a super script. You have access to a wide range of arrows from a pull down menu, but -> will give you a simple right arrow (although it is not very long). 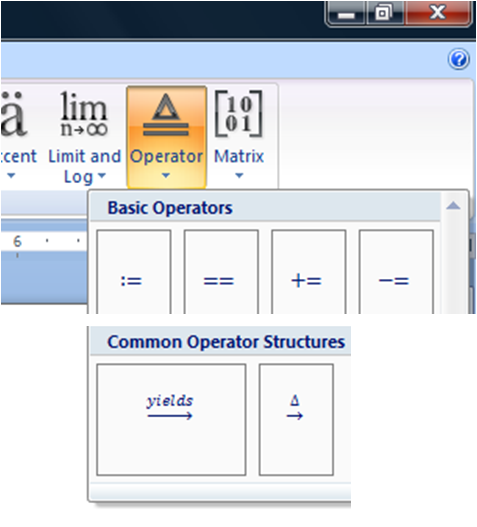 To get a long arrow, click on the operator button and choose the arrow with the word "yields" written over it under common operator structures. Click on the word "yields" and replace it with as many spaces as you need to create an arrow of whatever length you want. 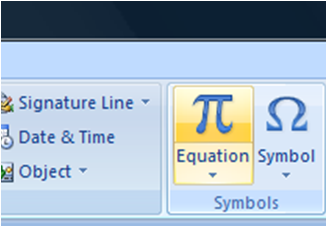 For older versions of MS Word, go to the insert menu and click on equation, which launches the Equation Editor Program (you can also find this program on your computer by searching for eqnedt.exe), which gives you the same ability to create equations. Thank you Katie! You saved a chemist life! by Marcelo Lima on Oct 19, 2017. That works, actually, there is no other possible way excluding some minor modifications. The problem is it does take a very big deal of time to write a simple reaction. Everyone actually needs an add-in, where you first enter reactant-product number, reaction type (kinetic or equilibrium) and automatically it will insert superscript-subscript enabled units with an appropriate arrow between them. We really need this thing. by Guray on Apr 26, 2018.
by jaden on Aug 02, 2018.
by James on Sep 05, 2018. Guray - there is such an addon. Only for office in Windows. by Jumala on Dec 07, 2018. There is third method to this which is math auto-correct. This method is similar to LaTeX. for eg to get degree symbol just type \degree followed by space and you are done. Since I don't know how to write math in comment, i am posting some links that will be beneficial for all. by Aniket Prakash Gupta on Feb 15, 2019.
by Mr E on Apr 17, 2019.